Having stood to restore the hand plane, I decided I could at least continue with varnishing the chairs, so using my two saw-horses and a piece of sheet timber I had, I created a mid height table, and got to work. I managed to get another two chairs varnished before the sponge I had, disintegrated, and forced me to stop. 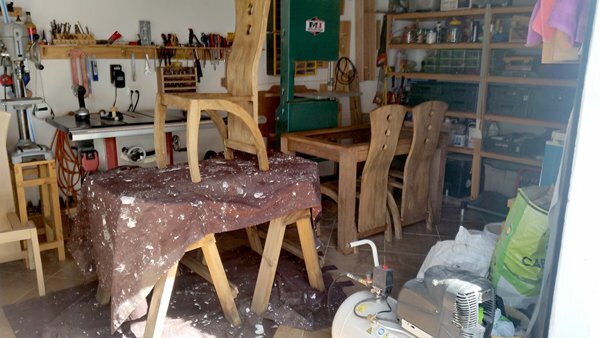 So, that is the table and three of the four chairs with their first coat applied. 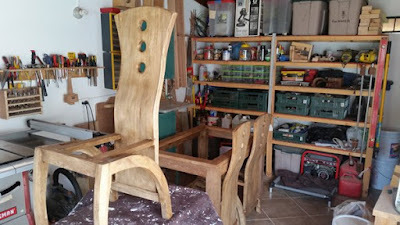 I have to say, that although it has saved me money, I wouldn't do this again, the build quality, especially of the chairs, leaves a lot to be desired, time will tell how long they last, they seem fairly sturdy, but I think that is more to do with the number of nails they applied, rather than the quality of their mortise and tenon joints. It has given me idea on how I could make my own, but, hopefully that will be sometime in the future. I am glad I stopped when I did, because tonight, I am paying the price. Despite taking pain killers, my back is killing me, I think, even though I was varnishing on a makeshift table, there was still some bending and twisting involved. I hope it is not too long before the spinal block kicks in. Tomorrow it is back to the cancer Doc, if it isn't one thing it's another!! !